This Chinese New Year’s Eve, as visions of lion dancers dance in your head, there’s no excuse for you to miss out on the food-filled festivities no matter where you find yourself. In fact, if you’re far from China, it’s an opportunity to experience the local unique spin to celebrating the Chinese New Year. Dumplings: It is customary for families to gather around and handmake dumplings, traditionally known as 饺子 (jiǎozi). During this year, dumplings are shaped to resemble ancient Chinese currency, called 元宝 (Yuán băo). Sometimes a gold coin is hidden inside one of the dumplings, bringing luck to the recipient of the coin. Just be careful not to accidentally eat the coin! Dumplings can be prepared a number of ways– boiled, fried, or steamed. Longevity Noodles 长寿面 (cháng shòu miàn): The long noodles symbolize long life and endless abundance. Nian Gao 年糕 (nián gāo): Literally means “year cake.” The word for cake, 糕, is pronounced the same as 高 (gāo), which means high or tall. The dish is then a homynym for higher year, signifying you’ll achieve new heights in the new year. A whole fish: Fish, or 鱼 (yú), sounds like the word for abundance, 余 (yú), and it is believed that eating fish will help your wishes come true in the near year. When served, the head and tail should be kept in tact so that the year starts and finishes well. When eaten, a little bit of fish should be leftover symbolizing a remaining profit. A common phrase is 年年有余 (niánnián yǒuyú), which is an offering of abundance year after year. 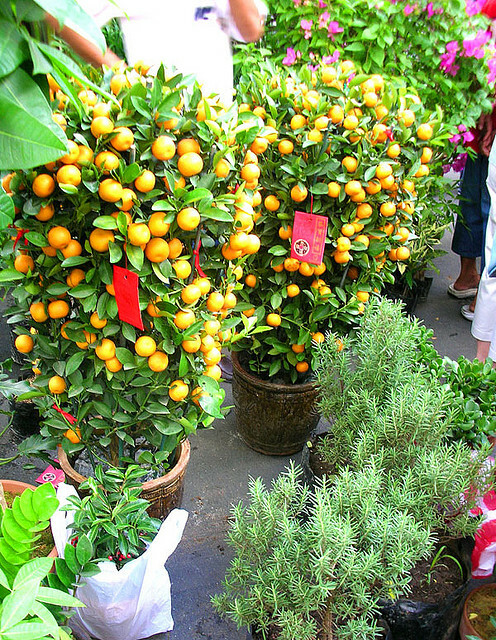 Mandarin Oranges 金橘子 (jīnjúzi): Considered symbols of luck and abundance. They are an extremely common gift given during this time of year; you cannot go wrong by gifting these to hosts, friends, and colleagues especially with the leaves still intact. 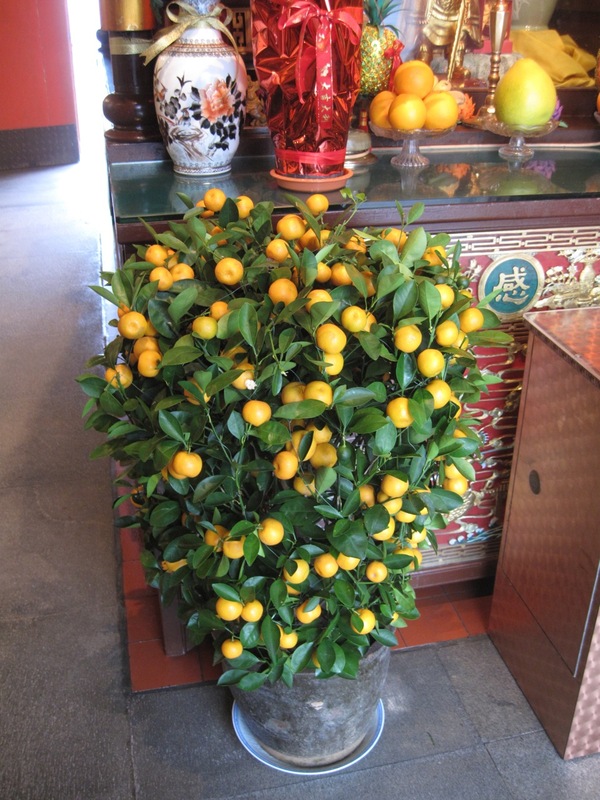 If you really want to go above and beyond, gift a potted mandarin orange tree. Think of this as the Chinese version of a Christmas tree. We want to see your efforts to celebrate Chinese New Year through using Waygo. Perhaps it’s a screenshot of your phone while using Waygo to translate a menu in order to find a Chinese New Year dish and a photo of the meal that ensued. Please let us know by posting screenshots, photos and stories on our Facebook page. 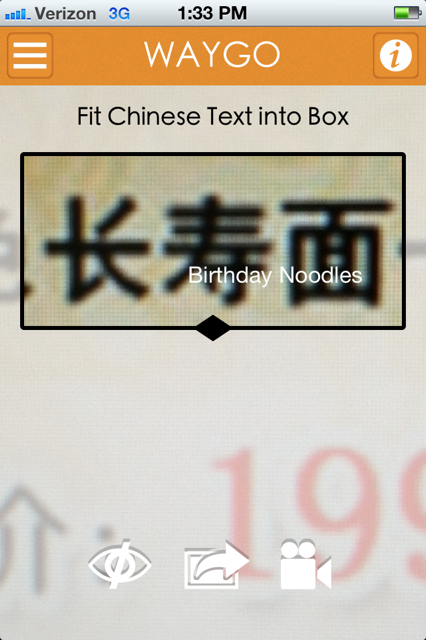 In this screenshot, Waygo translates Longevity Noodles as Birthday Noodles. Both translations are correct as this dish is also enjoyed during birthdays to symbolize many more years. Ancient Chinese wisdom says a snake in the house is a good omen because it means that your family will go without hunger. Having Waygo in hand is an extra good omen, because your family will eat better—no more mistakenly ordered dishes! During the past year of the dragon, we wanted to truly nail down the world of food instead of haphazardly translating all subjects from the get go. During the year of the snake, Waygo will expand to broader translations for life in China, from road signs to train schedules. Besides expanding to other subjects during the year of the snake, what else is to come? Helping foreigners navigate other countries, like Korea and Japan. Do you have visions for Waygo and what we can do? We’d love to hear your thoughts—please share them! And without further ado, let the eating begin!